My advice is to always get back up and do not let setbacks haunt you. Setbacks are a learning experience in this industry. Do not ever think, “You can’t”. I’m a perfect example of that. I wasn’t formally trained in a culinary school and I didn’t have much classroom experience but I kept shooting high. I did not let anything hold me back or knock me down. I had the pleasure to interview Adrian Davila. Whether it’s working the pit at his family’s barbecue restaurant, stirring up culinary creations in some of Colombia’s hottest eateries, or acting as guest chef in New York City, Adrian Davila’s connection to food runs deep. 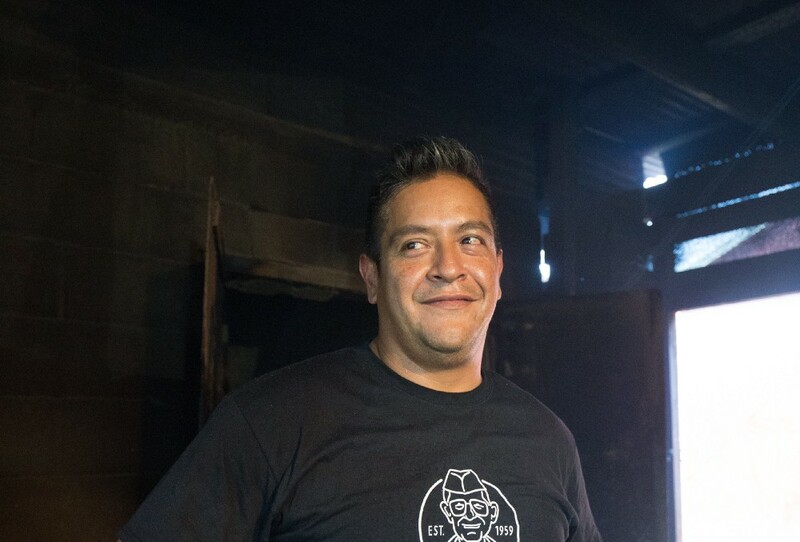 Adrian is a third-generation pit master, barbecue chef and restaurateur at his family’s acclaimed Davila’s BBQ in Seguin, Texas. He continues to honor his family’s legacy and the traditions of Mexican-American cooking, all while exploring his own unique identity. 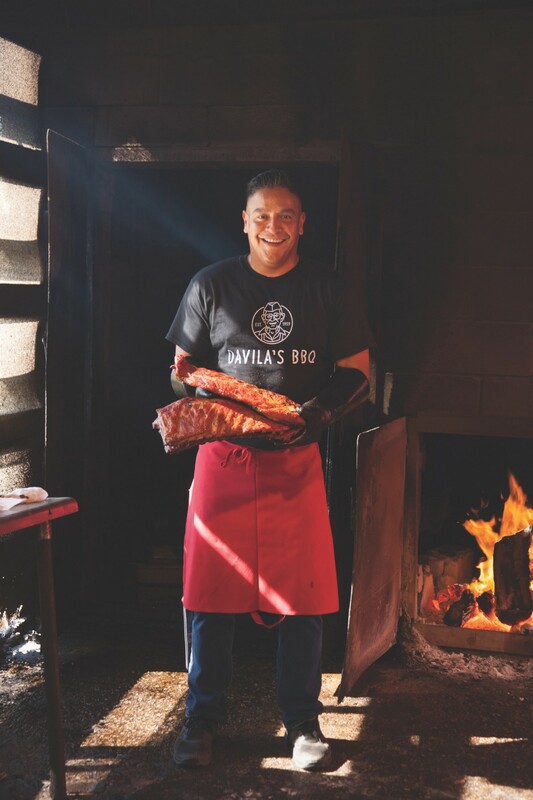 His grandfather, Raul Davila, opened Davila’s in 1959, and passed the secrets of his smoked barbecue to Adrian’s father, Edward. The family is proud of their commitment to creating the best barbecue in Texas. Adrian credits his grandfather and father with teaching him the value of hard work. Most of his youth was spent in the kitchens of the restaurant, learning the special techniques until he could prepare everything on the menu to perfection. 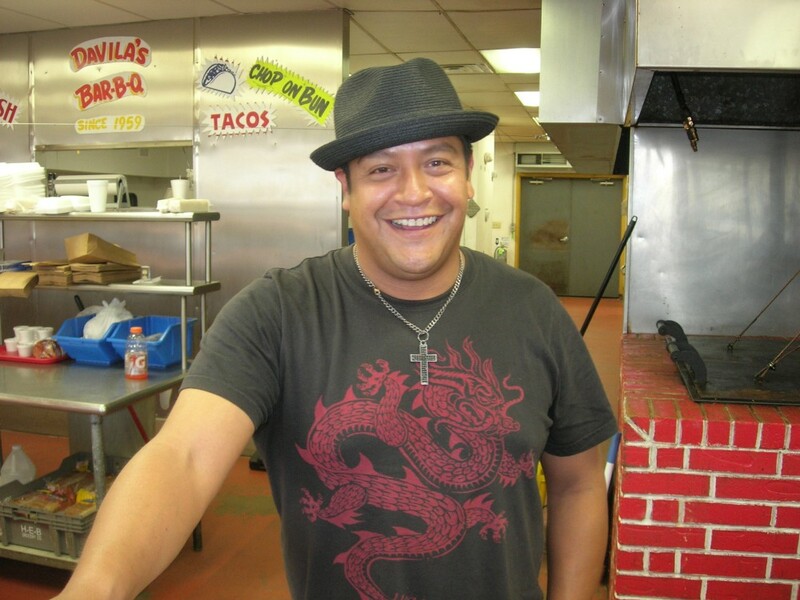 Adrian still practices those skills today, and has since created his own unique recipes for the restaurant as well as its extensive catering business. He has also taken some of those creations on the road to special events across the state in the restaurant’s food truck. He continues to expand his culinary knowledge and skills through research and travel, most recently throughout Europe, with a special stop in the city from which his family once hailed, Avila, Spain. He recently finished his first book, Cowboy Barbecue working alongside noted culinary author Anne Volkwein, and has promoted the book across the country. Adrian has been featured on Cooking Channel’s Man Fire Food, as a judge on the Travel Channel’s American Grilled, as a contestant (and first-place winner) on the Food Network’s BBQ Blitz “Texas Takedown,” as a guest chef on the Food Network’s The Kitchen, as a judge on the Food Network’s BBQ Kids Champion, and on Tastemade. Thank you so much for doing this with us! What inspired you to become a chef (or restauranteur)? I would sit out in the front of the restaurant, to watch people smile and enjoy the food. I loved the process of creating memories. Gathering over food with friends and family, you always remember what you eat and who you eat it with. I fell in love with creating that experience for people. I always wanted to be around my dad, Edward Davila, and my dad was always at the restaurant, working as my grandfather’s right-hand man and starting the concession and catering side of the business. The meat would come in and I’d watch my grandfather break down a quarter of a cow, do the butchering and sausage making and then take it all into the smoker. I would hide in the catering van at four in the morning and wait quietly until my dad arrived at the catering spot, to try to skip school and be with him. At six or seven years old, I’d stir the huge vats of scrambled eggs. I liked being part of the process. Throughout my high school years, I was very involved in sports and not in the restaurant as much. When I went to college, I realized the classroom setting wasn’t ever going to work with my ADD and my dad suggested I get to work. I began full-time at the restaurant working in the pits but I didn’t want the stigma of having something given to me, so I started working in the pits. Then, I opened a series of satellite locations over the course of the next 15 years, and even had a food truck for a while, which helped me to experiment with types of food I could cater. My specialty is outdoor cooking, including whole animals. I cook with the earth, utilizing the earth’s bounties. I use mesquite wood to grill with. I love herbs that can be found locally or in someone’s front yard and I cook underground. I was drawn to this kind of cooking by natural progression; this type of cuisine is embedded in my culture and ancestry. I basically unraveled the traditions that were already there. I had years of experience with this kind of cooking already so I just had to figure out what worked best in this part of Texas and run with it. Friday night, fish night, during lent season, all hands are on deck, my entire family often works with us during this season. My mother runs up to me yelling, “FIRE, FIRE!” I run, grab the fire extinguisher and dart to where my mother is pointing. I find out that what she was actually yelling is, “FIGHT!” I run into the dining room, fire extinguisher in hand and find a couple having a full-on food fight brawl! When I ran up to the couple they must have been flabbergasted that I had a fire extinguisher in my hand and stopped. In the end, I escorted them out the back door and all was fine. Progression would be how I define success. Success is going forward with what is in front of me. I have had many fantastic opportunities such as being on television and being a published author but I didn’t stop there. I used those opportunities to move forward and excel in cooking. Success is moving through the difficult times and progressing through any failures that have come my way, as well as any opportunities that have come my way. I had to shut the door on a couple of restaurants after I prematurely decided to over-expand the brand. I lacked the proper business organization to make the additional locations successful. I was able to learn and bounce back from those failures. I was able to experience this as a young chef, and because it happened in my younger years I was able to grow and learn how to run my business. I continue to work on several future pop-ups in South America and New York, I will be doing an underground cooking class in Dallas and I have a show being pitched to different major networks. My key to making perfect dish is using my surroundings. At my restaurant, we use mesquite to barbecue because it is available at plenty in this area. Using a traditional cooking technique with local ingredients can really create the perfect dish. Feel free to take this advice and draw inspiration from your surroundings to create your own dish. This is a perfect saying! Bringing people together is what brought me to love food. I love to say, “Tell me what you eat and I’ll tell you who you are.” Food is identity, different cultures share different techniques and when this can be on display for a group of people or even a couple, it usually brings a smile to someone’s face. Food, as I see it, is a gift. Presenting someone with food is a beautiful way to connect. 1. That running a restaurant would become a passion for me even though it is not always good to me, there are always hard times. — The hardships come along with having a flourishing restaurant, your personal life is affected because you’re always devoted to the restaurant more than you can be to any individual. 2. Because of the hands-on nature of the business, major holidays and religious holidays are often spent at the restaurant rather than with family. You spend more time with your employees than with family. — Your employees become family. There isn’t a Christmas where we haven’t had a celebration at the restaurant for the employees. On Easter, we serve the community. On New Year’s Eve, we are open and preparing meals as others are preparing for the new year. 3. I wish someone would have told me that I would spend more time delegating, taking care of municipal regulations (city codes), and customer service, rather than actually cooking. — So much goes into owning or running any type of business and the above stated is a prime example. I am the operator, manager, and supervisor of the restaurant. I also have to acknowledge that sometimes I need to be a clerk and take care of paperwork. 4. Despite how traditional the restaurant industry is, things change drastically. Over the past 30–40 years, there has been a major shift due in large part to social media. Premium retail space is not the only successful business model, social media is a key factor with hard-to-find restaurants. — Our restaurant is located in a lesser prominent, not ideal location. The rule of the game used to be “location-location-location”. Now, people search for small locations with hidden gems, because our restaurant is in a small town and set off from the rest of the booming chain restaurants we find that this is an asset. 5. I had no idea that the margin for error was so slim in profit, and that food and operating cost would rise so rapidly. — A few years ago brisket skyrocketed to the point where we either had to stop serving it at the time or raise the cost for the customers, this is a reflection of a volatile food market. I would use my influence to create food knowledge in others. Too often our health is depleted by food. If I could have a platform of educating people on how food is important to how you live and how you can live a long life I would. Some of the biggest names in Business, VC funding, Sports, and Entertainment read this column. Is there a person in the world, or in the US with whom you would love to cook for and why? I would LOVE to cook for President Obama. President Obama brought a new idea of unity and identity to the country. My ancestry and my food haven’t been presented and voiced in an optimal way, I feel that I can identify with him because we both show a beautiful side of our culture. I would love to show him my personal identity through food.